This year’s most colourful and high-profile annual event promises to be even bigger, better and more inclusive than ever! 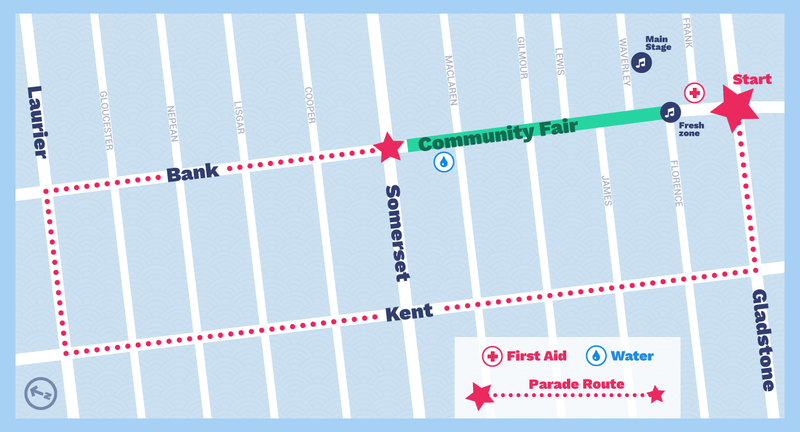 More than a hundred businesses, service organizations and allied community groups will set out from Gladstone and Bank and march through this village, showing just how colourful they can be! Line the streets and show your pride! After, be sure to join us at the Community Fair! Many years ago I attended a wine auction for Music and Beyond- It was great fun and I learned a lot just chatting to people. A client of mine was there who knew what he was doing and helped me bid on some wine – Did I know what I was doing? Nope! Was it fun? You bet! It all went to support a good cause and to the arts in Ottawa so it was all in all a great experience. This year I donated wine for a tax credit- so it can work in many ways.Of course drinking the fine wine is always more fun. When the weather starts to turn and the festive season approaches I find that wine auctions are a great place to buy wonderful wines at sometimes a very good price. Your online bid will become part of the live auction starting at 7:00 p.m.
Buy for Xmas for someone special or for the business partner. Buy special occasions with family or friends. (I did this one year at Christmas and we opened several bottles that I had bought at auction and it was great fun and felt very special and luxurious. If you know wine or even if you don’t and just want to have an enjoyable evening out or thinking of starting a wine collection or just like to drink good wine – this is a good place to start. Whether you enjoy the occasional glass of wine or have an established cellar, there will be something for everyone. September 24, 2013 | Category: Around Town, The "Hoods", The Golden Triangle, The shops around the corner. Ever go into a store and want to take half of it home with you? Well this is how I feel everytime I go into the White Monkey on Gladstone Ave. I enjoy the designs from all eras and the owners of this store have a great eye whether it be furniture or smalls, lamps, prints or all things retro especially from the mid- centruy. The owners Tim Robertson and Maciej Fijalkowski opened this store around 2007. Tim has a keen eye for finding treasures and together with Maciej (he is the hands on restorer) they have chosen quality pieces and in many cases reinvented many of the items to a chic New York style. This is not just an antique store it is a “style” store that brings you great ideas that are perfect for the urban dweller of any type of home or apartment. The one thing you notice is how well the different styles can mix together. Whether it is the deco buffet bar with the new black lamps atop or the 1970s teak couch recently reupolstered into a very contemporty look, the items provide not only great decor ideas but are of excellent quality. There is a back room full of lamps, dishs (great Fiesta ware) and vases. The upstairs has a room just for teak. If you are looking for a statement item there are lots to choose from. The designs are mostly from the mid century with some mint Deco pieces . Right now there is a gorgous Deco armoir, a Deco bar buffett and one of the nicest Deco buffets I have seen (worth buying just for the handles). There is also the lacquered chests of drawers in white or black that are very modern and have that sleek style that is so popular now for apartments. There are mid century chairs that have been reupolstered providing a modern but warm look. Of course all around is artwork and lots and lots of lovely smalls from glass jars of shells to Japenese laquered boxes. This is a store to go find that “right piece” for any room. An eclectic mix of furniture and accessories for every taste. While I was there a gentleman bought two Chinese figure lamps for his hall table – one larger that the other – he was going to put them side by side – one was a brillant yellow and I think the other red. What a great idea and certainly a statement. As he said ” Why not!. September 5, 2013 | Category: Around Town, The shops around the corner. I was out looking for some antique wall sconces to replace ones that we broken and my first stop for that type of item is always Yardley’s Antiques on Bank Street in Old Ottawa South. Eric (the owner) was there as he typically always is and was plugging coins into one of his two jukeboxes, so “he could hear the songs he liked”.